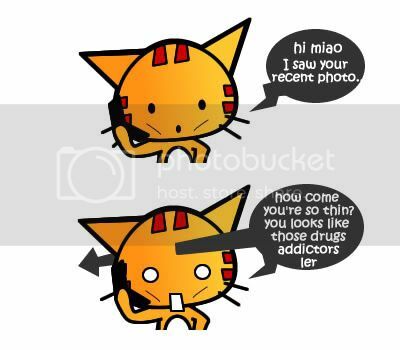 Miao & WafuPafu Comic Blog » Omg! I lose 5kg!! A No is a No. 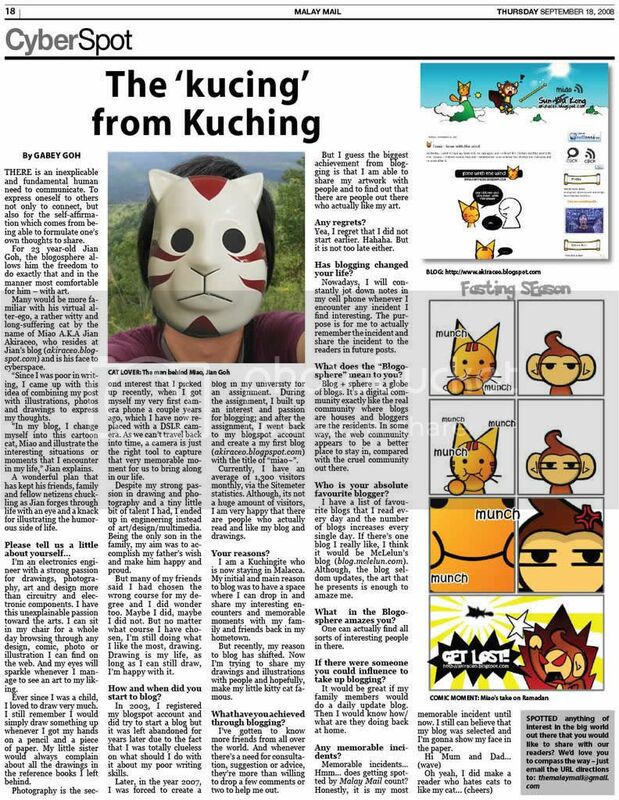 Posted on November 20, 2008 by Jian Akiraceo. This entry was posted in Rant and tagged drug addict, lose weight, thin. Bookmark the permalink. hahaha! 😛 woah, losing 5kg’s is a lot! 😀 take good care of urself~ love those kitties. hehehehe. lol…. you can always bring apple to work if you want to. And you actually get healthier by not eating supper =) … but not by not eating breakfast. And you actually get healthier by nt eating supper =) … but not by not eating breakfast. wow. 5kg in 3 months?? Yalor.. 5kgs @@ gosh..I also cant believe it.. But I’m not healthy ler.. This is soooooo TRUE!!! hahahaha woah.. from cyber eh? I also have no idea.. maybe working stress got to do with it too..
That’s weird. I thought you will spend more on food when you are earning money. Well, that’s happening to me la.. Hehe. 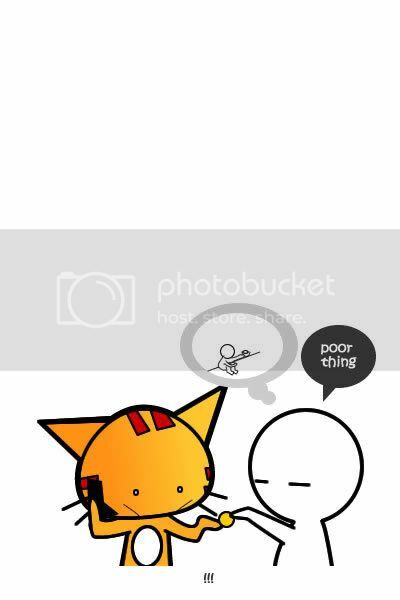 lol.. the comic is cute and funny. 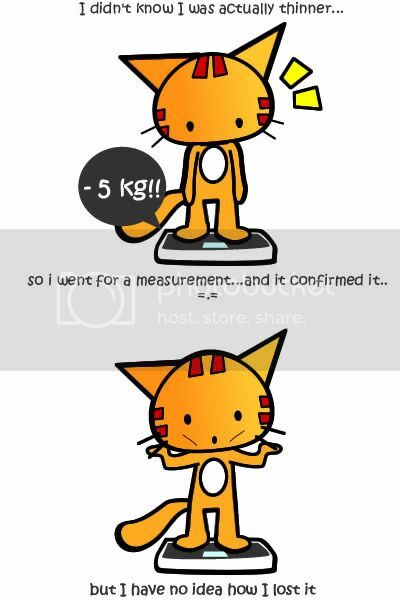 Few weeks ago, I went for measurement too and I got 10 pounds lighter without doing anything. Then only I realized that my measure has problem. After all, I didn’t lose any weight. I also wanna lose weight…. miao miao fat fat only cute geh ma. thin cat really not nice la..
Hahaha.. too thin the arm macam batang.. not nice with short sleeve shirt.. I also want to lose 5kg lerrrr !!! ur last pic just cracked me up! good one! like that i ma need to eat a lot? Is an unhealthier sign for u …… Breakfast is most important thing in a day started. Tis will make ur mind looks indifferent. ….BTW…i love the cats….